Daily Spirit & Word: 701: Lettuce Christians. The Fantastic Fourteen “Let Us” in the Book of Hebrews. I had a funny thought this morning, I know, I know, I get them all the time 🙂 I was quickly reading through the book of Hebrews and was struck by the number of time I came across the short phrase “Let us”… Then I remembered how when I was a young Christian I overheard an older, more mature, believer say, “I do wish the minister would stop saying ‘Let Us’ anyone would think we a salad Christians”. It makes me laugh out loud even today. So my friends, whenever you hear your Minister in his sermon saying “Let us”… Don’t go rolling your eyes, don’t go thinking to yourself “Here we go again”, because when your Minister says “Let us” he is in GREAT company, for God’s Word is choc-full of “Let us”… It seems to me that God wants those He’s chosen to belong to His family to allow Him to change them into confident and assured children. He could have given a direct command from Heaven, instead He encourages us in much more gentle tones “Let us” as if He’s involved in it with us. Here are the 14 “Let Us” Statements from the book of Hebrews. 1) “Fear,” – Hebrews 4:1. 2) “Be diligent,” – Hebrews 4:11. 3) “Hold fast,” – Hebrews 4:14. 4) “Draw near with confidence to the throne of grace,” – Hebrews 4:16. 5) “leave elementary teaching,” – Hebrews 6:1. (Lettuce Leaves). 6) “Draw near,” – Hebrews 10:22. 7) “Hold unswervingly,” – Hebrews 10:23. 8) “Stimulate one another,” – Hebrews 10:24. 9 & 10) “Lay aside every encumbrance… and run with endurance,” – Hebrews 12:1. 11) “Fix our eyes on Jesus” – Hebrews 12:2. 12) “Be Thankful,” – Hebrews 12:28. 13) “Go out,” – Hebrews 13:13. 14) “Offer up a sacrifice of praise,” – Hebrews 13:15. Every single “Let us” in the book of Hebrews is like a Divine invitation into the deeper Christian life. When we practice these encouragements, when we’re obedient to them, we are going to be so immensely blessed as brothers and sisters in Jesus Christ. So the next time your hear it, don’t roll your eyes upwards, but let your heart be stimulated to KNOW you are HEARING God’s Word of exhortation to do something truly wonderful for Him, but in the doing it’s YOU that’s going to benefit. I remember once having a “Bring and Share Supper”. We’re encouraged to bring something so that we can all share in a great big meal. When everyone had arrived, guess what we had? Nothing but salad, everyone had brought along LETTUCE and other salad vegetables. It was strange, but I’ve never forgotten our salad fellowship meal. Someone quipped that night, as prayers were offered, “Oh Lord Jesus Christ, we are just a few Salad Christians, Lettuce draw near with faith” Everyone laughed out loud. But we’re closer to Jesus Christ because of it. But my friends, on this Wednesday morning, half-way through the week, LET US be encouraged to go deeper with Jesus. Let us, Be full of God’s Spirit. Let us, Be doers of God’s Word. Let us, Take Christ’s yoke and burden, for His yoke is easy and His burden is light. Let us, Go to Him, outside the camp, bearing the disgrace He bore for us. Prayer: Oh Lord, let us be “Let us” Christians. Amen! Have a wonderful day with Jesus. P.S. Alpha last night was something special. We had the TALK on Faith. We discovered that the word “FAITH” is over used and undervalued, it’s misunderstood and misapplied. People call ‘religious’ people, “Faith Communities”, no matter what religion they come from. You know when you see the proverbial penny drop, well some people last night had that experience. At the end of the evening I said this; “There is a real difference between faith and FAITH”… Faith in Jesus Christ isn’t simply believing that He existed, died upon a cross for our sins, rose again from the grave and ascended into Heaven. That’s NOT saving FAITH, but merely intellectual assent. It’s just acknowledging the facts. However, saving FAITH is when we know all these things are true and then we respond to Jesus by putting our TRUST in Jesus for our SALVATION. It’s a bit like this. You know that No2 Bus will take you to Brixton, but when the bus comes along, even though you read the sign at the front that says “Brixton”, you know it’s true, the bus has arrived, you see others getting aboard, but something is stopping you getting aboard. My friends, to get to Heaven you need to exercise SAVING FAITH and put your trust in Jesus. Get aboard, stop doubting, believe that He can carry you all the way to Heaven. P.P.S: Tonight: Street Witnessing: We’re going out tonight to share the Gospel on the Streets of West Norwood in London. Have you ever gone out to share the FAITH of Jesus Christ? You can come with us. You can be trained to share the Good News the way that Jesus did. Every time I go out, I’m a bit nervous to begin with, breaking the ice with complete strangers is never easy, but from long years of experience of doing just that, I know that Jesus is with me. He gives me His WORD in season for those who stop and chat. I’ve seen Him move upon people by His Spirit. I’ve seen His power at work in people to draw them to Himself. All because we’ve gone out in faith. Come! Come and share, because there are many people who are headed for Hell and don’t know it, their Eternal Destiny is in your hands. Jesus Commanded us to “GO” in His Great Commission. It was a call for every follower of Jesus to go out and share the Good News with everyone. How’s your faith sharing going? Don’t just be a pew-warmer on a Sunday, get your sleeves rolled up and get on with the work, it’s a JOY to share in Jesus Kingdom business of winning souls for Heaven. Sharing the Gospel is the MOST loving thing you could ever do for someone. If you need ENCOURAGEMENT today. Here are the Fourteen “Let Us” statements, they are encouraging verses from Hebrews. (God’s Word is Choc Full of Lettuce 🙂 “Let Us”). Hebrews 4:11 (NIV) Let us, therefore, make every effort to enter that rest, so that no-one will fall by following their example of disobedience. Hebrews 10:24 (NIV) And let us consider how we may spur one another on towards love and good deeds. Hebrews 13:13 (NIV) Let us, then, go to him outside the camp, bearing the disgrace he bore. 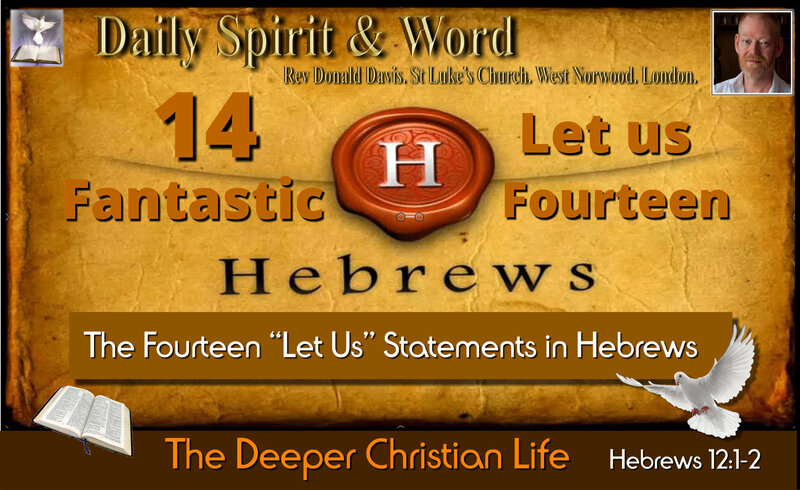 The Fantastic Fourteen “Let Us” Statements in the Book of Hebrews.